We will never forget our fallen comrade. A weapon of infinite jest, of most excellent fancy; it hath carried me through the sky a thousand times, and now, how abhorred in my imagination it is. 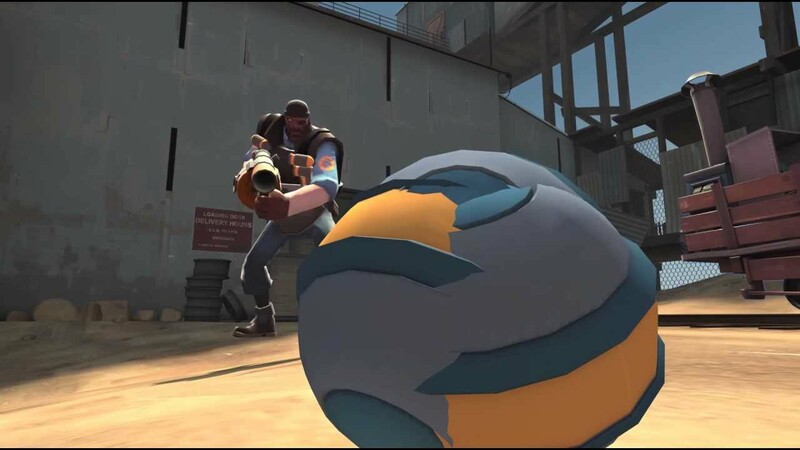 A harmless weapon that once stood proudly among the few Demoman unlocks, a weapon that has seen its abilities gutted slowly but surely, a weapon whom Valve later updated to look and sound terrible, a weapon that created an entirely new playstyle for the Demoman, and most of all, a weapon that was pure unbridled fun. SilverWolf rediscovered his love for the Demoman due to this weapon. He wasn’t the only one. It’s been four years and I maintain that the 8-clip nerf was entirely unnecessary. At the very minimum Valve should have let us keep three stickies, since there are triple-sticky jumps in TF2 that Demomen can use when either overhealed or Ubercharged. But it doesn’t matter. This wasn’t a rebalance built around logic. 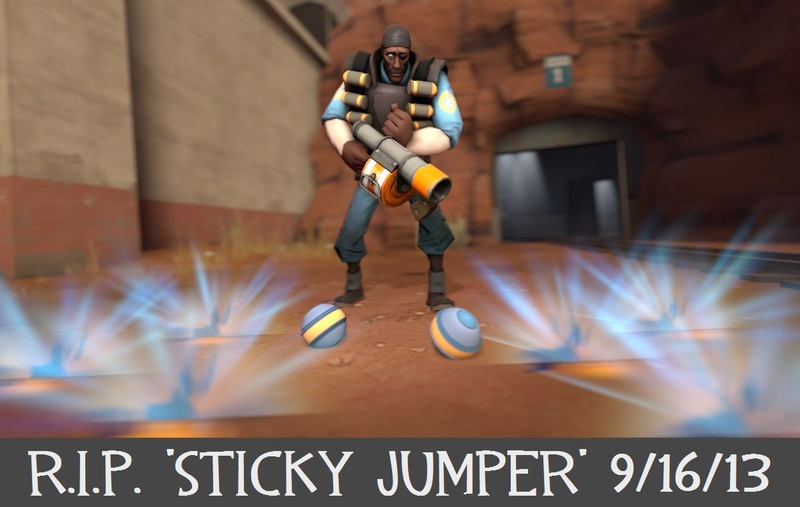 Of all the weapons that were hurting TF2 at the time, the Sticky Jumper doesn’t even register. 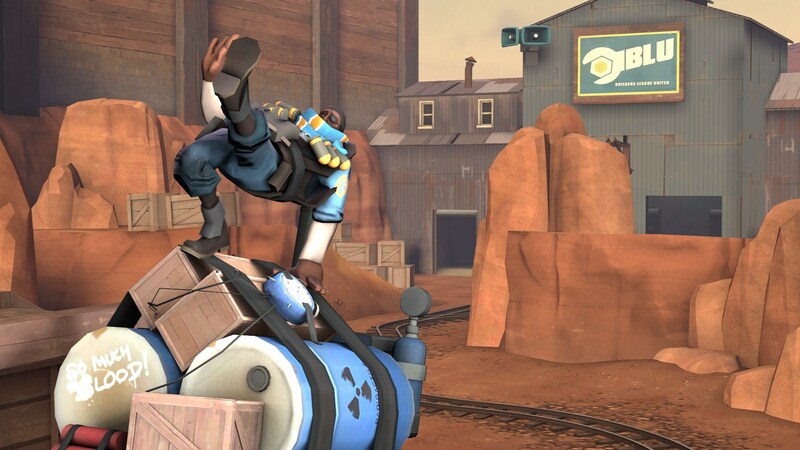 At this time the Pomson 6000 was deleting spies and Ubers from the game, but no, let’s stop Demoman from jumping higher! Picture by MC94. But this article isn’t about whinging over a nerf that clearly isn’t being lifted anytime soon. Jump Day is a time to celebrate the Sticky Jumper. Despite Valve’s best efforts, its still a blast to use. None of the nerfs have yet removed the sheer freedom the Sticky Jumper grants, and while the various sword nerfs have made it tougher to play a hybrid jumper knight, the Pain Train remains untouched since it was added to TF2, so the backcapping playstyle is unaffected. You can even celebrate the Sticky Jumper if you don’t play TF2 anymore! Overwatch’s Junkrat was recently buffed to carry two concussion grenades, which makes them feel a lot like the 2-clip Sticky Jumper. Complete with his primary weapon and melee attack, he’s as close to the Grenade Launcher/Sticky Jumper demoman as any other game is going to get. It’s honestly kinda cool that the Sticky Jumper transcended TF2 to leave a legacy that touched another game. Much like the Crusader’s Crossbow, it created a niche playstyle that was all its own, and said playstyle was so fun that it survives beyond the weapon itself. Coincidentally, Junkrat and Ana are soon to be ported to Heroes of the Storm where hopefully their jumping and crossbowing will continue there. So if you haven’t used your Sticky Jumper recently, today’s the day! Dust it off and defy gravity for a while, like in the good old days. Maybe caber a sniper or two. The Sticky Jumper might be restricted to 2 stickies, but the sky’s still the limit!